Imodium 2 mg 6 tabl. Imodium lingual 2 mg 6 orodispersible tabl. Imodium 2 mg 12 tabl. Imodium lingual 2 mg 12 orodispersible tabl. Imodium is a medicine used to stop diarrhoea. The active ingredient loperamide reduces the speed at which the gut contents is pushed through the intestines, allowing more time for water to be reabsorbed back into the body. This results in firmer stools. 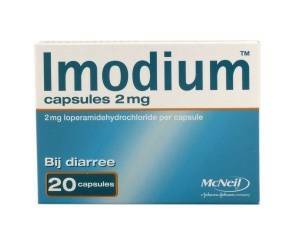 Imodium is used to treat acute diarrhoea and chronic diarrhoea in adults and children over eight years of age and is available in various forms. You can get Imodium at your local pharmacy or we can order it on your behalf from a registered pharmacy in the EU. Imodium alleviates these symptoms by slowing down the muscular contractions of the intestine, reducing the speed at which the stool leaves the body. Imodium helps the digestive system get back to its normal rhythm, resulting in a normal stool consistency. Imodium is a fast-acting treatment and takes less than a few hours to take effect, which reduces the chance of dehydration (loss of water, salts and sugars from the body). Adults: to treat acute diarrhoea, take two capsules or tablets straight away, and then one more capsule or tablet after each loose stool. Stop as soon as your symptoms settle down. To treat chronic diarrhoea, start with two capsules or tablets, and then adjust the dose until you have one or two normal stools a day. Do not take more than eight capsules or tablets in any 24-hour period. Children aged eight and above: start with one capsule or tablet. Then follow the dosing directions for adults. In children, the maximum daily dose is determined according to body weight. Please refer to the chart in the package leaflet for more information. Continue to use Imodium capsules or tablets until your symptoms improve. If your diarrhoea lasts for more than 48 hours, you should consult a doctor. Read the package leaflet before use. Imodium may cause side effects such as headache, dizziness, constipation or nausea. For more information on possible side effects, see the package leaflet. Consult a doctor or pharmacist if the side effects are severe or bothersome. Do not use Imodium if you are allergic to any of the ingredients in this medicine (see the package leaflet) or if you have a bacterial intestinal infection (e.g. salmonella infection), inflammatory bowel disease such as ulcerative colitis, or diarrhoea with high fever, persistent stomach ache or bloody or mucus-coated stools. This medicine is not suitable for use in breastfeeding women. If you are pregnant, do not use Imodium without your doctor’s approval. For more information about contraindications and warnings, see the package leaflet.